Every morning, and again every evening, Harland does his chores. 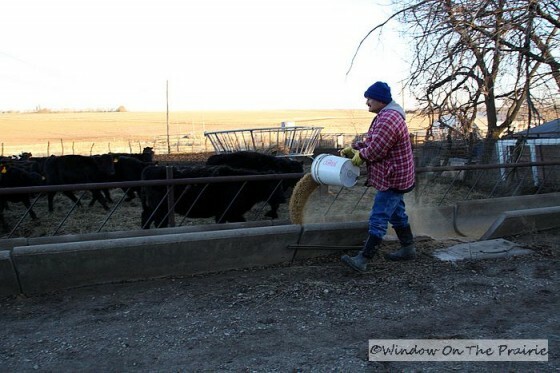 This time of year, this means feeding the calves and bulls. The cows are still out in the cornfield cleaning up what the combine left behind and are pretty self-sufficient right now. The calves, born last March and April, were weaned in November and are now in a lot at the farm, which is up the road from our place about a mile, and is where Harland grew up. The calves are now on hay and grain, and sometime next month, will be sold at the cattle auction. They have hay available to them all the time, and get a grain ration twice each day. 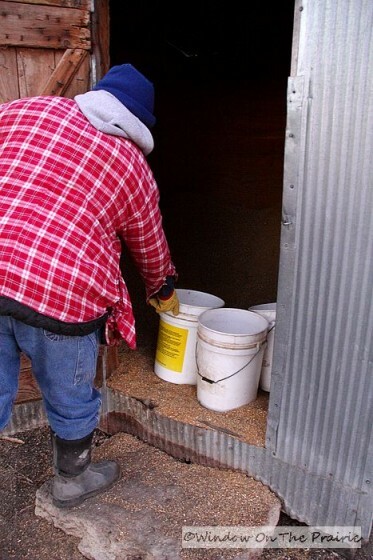 First Harland fills several buckets with grain from the grain shed. 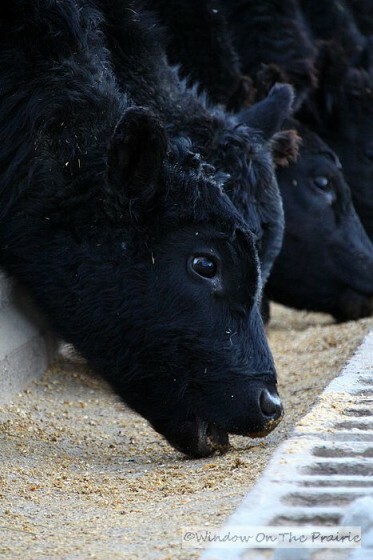 The calves love grain and gather eagerly at the trough. It’s a mixture of oats, corn, soy meal, distiller’s corn (what’s leftover after ethanol production) and flavored with sorgum molasses. 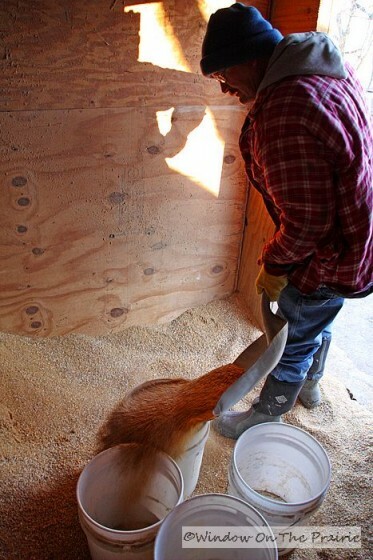 Next, he pours out the grain into the trough and most of the calves dig in. Some are kinda shy and are reluctant to come up to the trough, so he fills another small trough for them out in the lot. 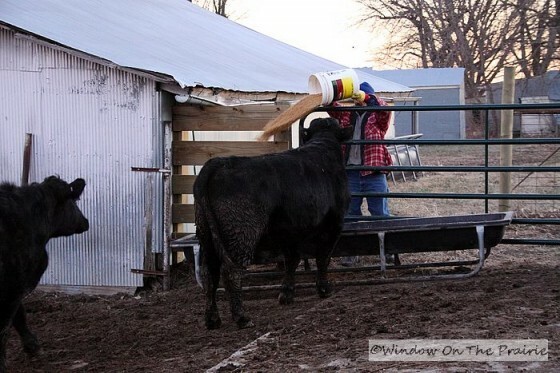 Next he takes care of the bulls. We have 2 right now, and this time of year they are in a lot by themselves. George, left, and Fred, middle, are each 2 1/2 years old. Bob on the right is 2. Bob is a steer (castrated bull). Up until this summer, we thought he was a heifer (young female). Whoops. Bob will serve his purpose when we run low on beef in the freezer. 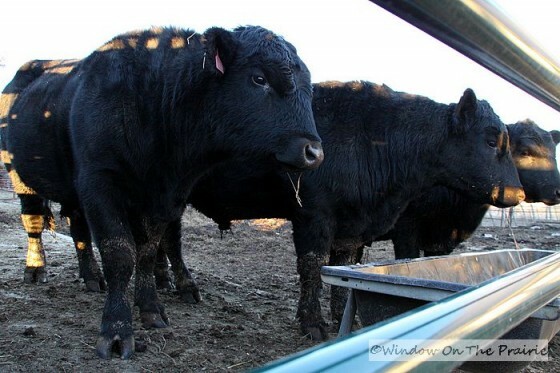 While we’re looking at the bulls (and Bob) here, I just have to say that these are the most benevolent looking bulls I’ve ever seen. They look so shaggy and hugable don’t they? Not like a bull we had a couple years ago that looked like Hercules with hooves. Anyway, they get a ration of grain too. This evening they were also low on hay so Harland gave them another bale. and heads back to our place down the road. This is what the chores consist of from November through February at which point the cows (pregnant now) will be brought in off the cornstalks and put in a small pasture near the house. 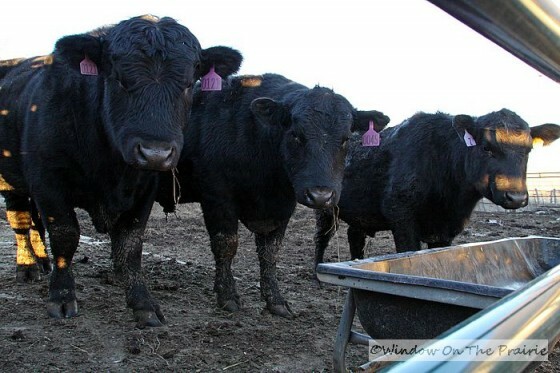 Harland will feed them hay and also check on them several times each day to assist if any of them have trouble calving, and to vaccinate new calves. 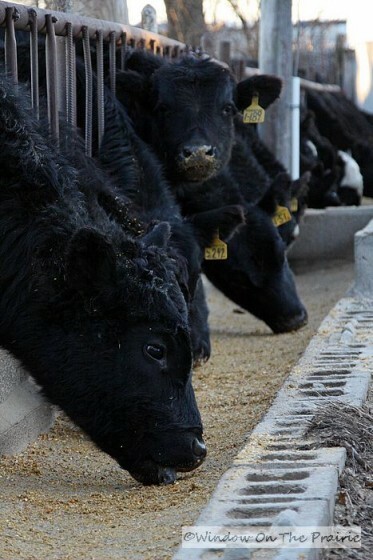 Our busiest time of the year with the cattle is just around the corner. Stay tuned. —-> Tomorrow: An Update on Panda Calf. He’s growing like zucchini in July. Bald Eagles on the wing. How to make coasters out of ceramic tiles. Apple-Raisin Folds: A recipe from a 1951 cookbook. 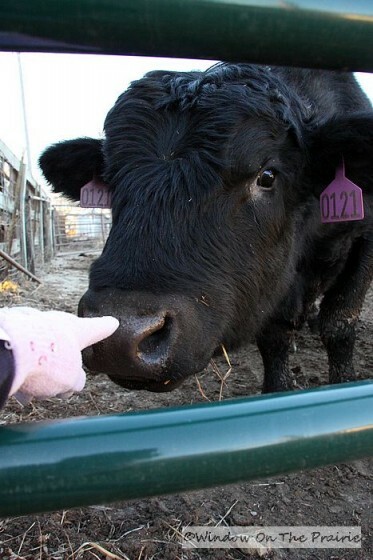 That’s so funny the bull there looks like he wants a kiss. Very unlike old Herecules, who was definitly huge. Poor Bob is not looking forward to the freezer. 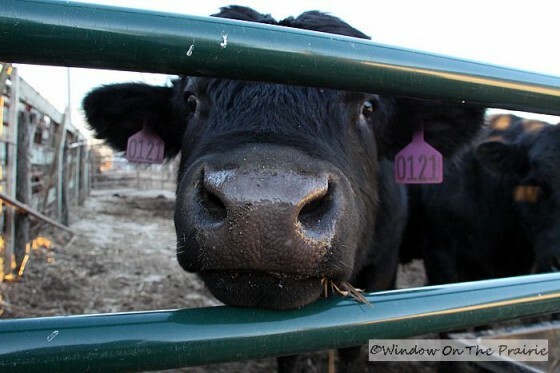 Love the farm pictures…I like the picture of #242 (?) licking her lips! And that is one serious looking bale mover! 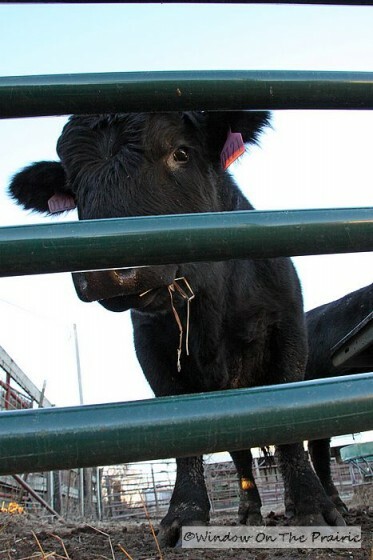 George, the bull is quite handsome…poor Bob. Oh well it is destiny that he becomes pot roast. 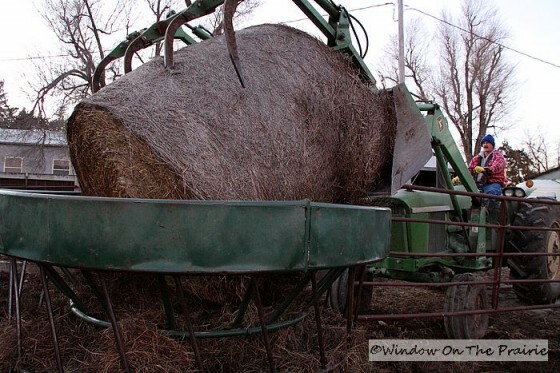 By the way how does the bale hoop work? Does Harland have to take off the netting? 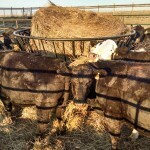 The hay hoop keeps the cattle from trampling and soiling the hay. Harland cut the netting off before he brought it into the lot. Thanks Tina. Posts like this are very interesting! Here, in North Carolina, I drive past cattle but know nothing about them or what it takes to care for them. One field I drive by several times a week always has a lone goat in with the cows. Why is that goat there???? 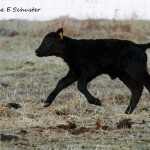 How does Harland decide to number the calves? How long do you keep your bulls? What age do they “go to work”? The numbering system for the calves is the last digit of the year + the mother’s ear tag number. We keep bulls for about three years. The bulls are ready to work at two years of age. Great posting! And Bob (aka-ribeye)and his buddies are very huggable looking! Look at the claws on that thing! 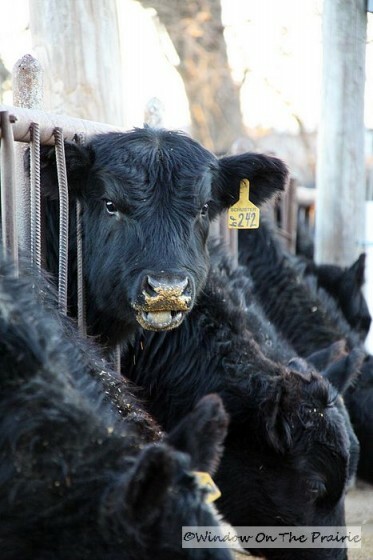 The calves look so cute with the food stuck on their faces… just like babies. 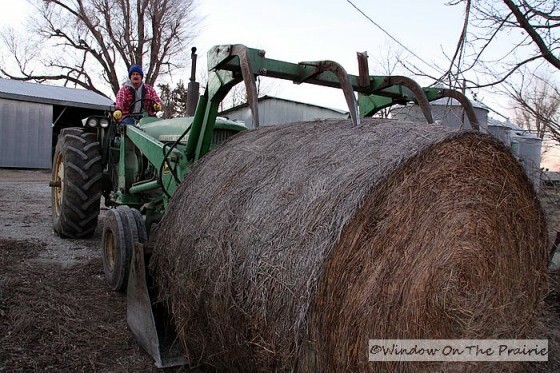 Those pics certainly take me back to my childhood on the farm! 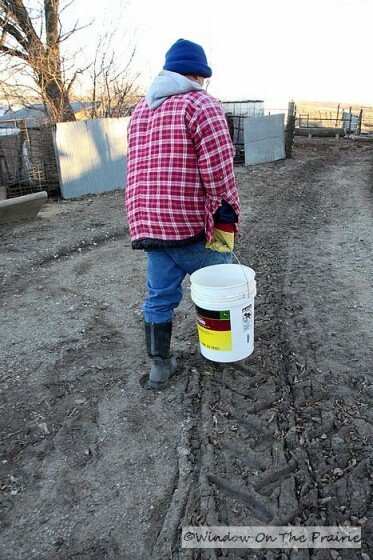 There’s a lot of hard work involved in farm living, and chores that HAVE to be done no matter what. Thanks for the trip down memory lane! I know you and Harland travel for fun and work, since we get to see the photos. 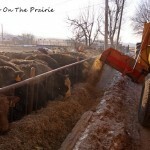 Who does the farm chores when you are gone? We don’t get away much when the cattle are around home from Nov thru May, but when we do, Harland’s nephew Andrew generously takes over the chores for us.